How can I save energy with window awnings? Have you notice yourself spending more money on home energy costs? You’re not alone. Many Americans are spending more monthly on home heating and cooling, but what if we told you there’s a way to cut down your home energy costs. Would you believe us? You’re in luck. There’s a way to improve the energy efficiency of your home and you can start by hiring a professional to do your retractable awning and window awning installations. Awnings are home features that enhance the curb appeal of your home while providing you more opportunities to reap the benefits of high quality home energy efficiency. In fact, fabric awnings are perfect for beautifying your home landscape while saving you money on home maintenance. Fabric awnings can help you reduce your cooling energy cost by 50% during the warm months of spring and summer, while keeping your home cozy during the winter time. If you live in a region that experiences frequent rainfall, we recommend purchasing tightly woven fabric, as these fabric awnings are more water-resistant than other fabrics. With woven fabric your awnings will experience less mildew problems and fading from sunlight exposure. For the best energy saving results, we highly recommend window awning installations. Window awnings will protection your furniture, drapes and carpeting from fading. The window awnings will also protect you and your family from dangerous UV ray and inclement weather such a severe thunderstorms. Simply awnings are the perfect finishing touch to any home. Carroll Awning Company is here to provide you high quality awning designs and installations today. 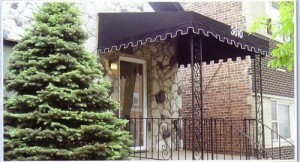 Here at Carroll Awning Company we can design and install custom awnings for your residential property. We are 100% dedicated to providing unique, polished residential awnings no matter how small or large your home property may be. You can count on Carroll Awning Company to beautify your home property with high quality, exceptionally sturdy window awnings and more.